The Volvo V60 is an upscale wagon available in a dizzying variety of versions that emphasize comfort or performance. Each has a distinctive personality. The V60 lineup includes sporty R-Design and Polestar models, a rugged Cross Country version, and the standard Dynamic model, practical and comfortable. Closely related to the S60 sedan, the 2018 Volvo V60 wagon sees little change for the model year. A cold weather package has been made standard, including heated seats and steering wheel. A redesigned V60 is expected to go on sale during 2018. Once a staple of suburban family life, wagons have for years been disappearing, though Jaguar, BMW, Mercedes-Benz, and Audi have continued to introduce new models. Available with either front-wheel drive or all-wheel drive, the Volvo V60 Dynamic holds a T5 turbocharged 2.0-liter four-cylinder engine that makes 240 horsepower and 258 pound-feet of torque. An 8-speed automatic transmission is standard on all V60 versions. The V60 Cross Country has a taller ride height and a chunkier appearance. It comes with the 240-horsepower engine. It’s sort of a cross between a wagon and a crossover. Stepping up a notch, the V60 R-Design has a firmer suspension, bigger alloy wheels, and a turbocharged and supercharged 2.0-liter engine called the T6 that develops 302 horsepower and 295 pound-feet of torque. The V60 Polestar is fitted with a racing-derived Ohlins suspension, making it the hottest compact luxury wagon on today’s market. In Polestar form, the turbo/supercharged 2.0-liter engine generates 362 horsepower and 347 pound-feet. Volvo has long been known for its first-rate safety record. The National Highway Traffic Safety Administration has not yet crash-tested a V60, but its S60 sedan mate earned top five-star ratings all around. The Insurance Institute for Highway Safety gave the V60 a Good rating for its small front overlap (driver’s side), and for the moderate front overlap crash. Front crash protection was deemed Superior, with certain optional equipment installed. A rearview camera is optional rather than standard on the base Dynamic model. All versions include low-speed automatic emergency braking. Upper trim levels add full-speed automatic braking and adaptive cruise control, which are optional for Dynamic and Cross Country versions. Blind-spot monitoring is standard on upper trims, but part of the $1,950 Vision Package for Dynamic models. T5 Dynamic AWD ($40,250) substitutes all-wheel drive. Cross Country ($41,850) is equipped similar to V60 Dynamic, with taller ride height. Cross Country Platinum ($45,700) adds HID headlights, Harman Kardon audio, and full-speed automatic emergency braking. T6 R-Design Platinum AWD ($49,100) gets the more potent turbo/supercharged engine and all-wheel driving, along with a firmer suspension and 19-inch wheels. Polestar AWD ($61,600) moves up to the 362-horsepower variant of the 2.0-liter turbo/supercharged engine. Appropriately curved, the V60 is far removed from upright, boxy-profile wagons of the distant past. Essentially, Volvo has built upon the conventional S60 sedan’s shape, adding a sizable dose of utility that integrates nicely into the overall design. Each V60 version has a look of its own. Base Dynamic models incorporate a moderate amount of chrome. R-Design editions get more racy body details, along with bigger wheels. Among other distinctive styling elements, the Polestar rides on lovely wheels wearing low-profile tires. Cross Country models feature additional ground clearance. Rugged-look body details include unpainted fender flares. On the whole, the V60 wagon echoes the attributes of Volvo’s S60 sedan, boasting comfortable front seats, though space can be snug with all seats occupied. Back-seat room is good for a compact, but unexceptional. Controls are somewhat awkward, with an abundance of buttons, in a cabin that looks dated, even grim. Standard aluminum trim can be replaced by glossy and matte wood surfaces for a more sprightly appearance. High-quality materials are the rule. Standard nicely-grained, soft-touch leather upholstery is available in several shades, beyond beige and black. Polestar models get synthetic suede with contrasting stitching. Cross Country wagons are offered with thickly grained, saddle-hue leather. Heated front seats now are standard, with heated back seats optional. Though stretch-out space is limited in back, the rear bench is well padded, with decent head clearance. Cargo volume is about 20 cubic feet with second-row seatbacks upright, growing to 48 cubic feet with the split-folding rear seatback folded. Those figures match many small crossover models. Long on buttons but short on features, the infotainment system is outdated and cumbersome. Though the 7.0-inch screen is crisp and bright, the system lacks Apple CarPlay and Android Auto compatibility. Surprisingly sporty when fitted with the stronger engines, the V60 is competent overall, though not as refined as some. Even the Polestar edition isn’t quite a model of high-performance, as promised by its styling. The base T5 engine delivers admirable thrust, with minimal turbo lag and a sense of serenity. Compared to similar-size engines from German automakers, though, it sounds coarse when underway. At idle speed, thrumming sounds can be heard within the cabin. Steering is well-weighted, and the suspension is soft enough to deliver a relaxed, comfortable ride. In R-Design models, the T6 engine feels significantly strong, though not much more refined. The suspension is stiffer, and 19-inch tires aren’t as adept at smoothing out minor road flaws. Overall, an R-Design might feel too firm for some tastes, though it rides and handles with a sporty sensibility. Helped by Ohlins suspension struts, the Polestar is more compliant, as well as more stimulating, without excessive harshness. With 2 extra inches of ground clearance, the Cross Country adds confidence on a trail or when coping with snow, but it’s not ready for serious off-roading. Fuel economy reaches above average, though all-wheel drive takes its toll. With front-drive, the T5 engine is EPA-rated at 25/36 mpg City/Highway, or 29 mpg Combined. All-wheel drive sinks the rating to 22/33 mpg City/Highway, or 26 mpg Combined. The Cross Country dips to 22/30/25 mpg. With its turbo/supercharged engine, the R-Design is EPA-rated at 22/32 mpg City/Highway, or 26 mpg Combined. Picking a Polestar shrinks the rating to 20/27/22 mpg. All versions have a stop/start system. Among smaller luxury cars, Volvo’s V60 wagon stands out for its sensible, practical benefits. Few competitors exist anymore. 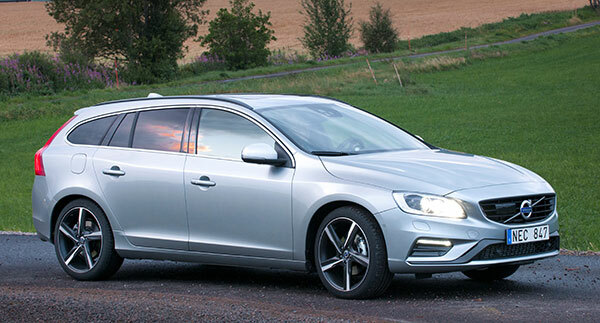 Each V60 is well-equipped for its price, and Volvo offers a broad range of configurations. As expected, prices can get out of hand as options are added.